Note: Sorry to those who were interested in hearing about this topic a month ago. I was sidetracked. Life moves pretty fast – I didn’t want to miss it. Birds do it. No, not THAT. Premastication. The process of chewing food before giving it to your young. Alicia Silverstone also does it. There has been a lot of “gross” utterances after viewing this video. Although Alicia Silverstone has done much more than Clueless (and Aerosmith videos! ), she is best known for that classic 90’s movie. Perhaps her inner Clueless Cher was coming out when she posted that video, because “anything you can do to draw attention to your mouth is good.” She has been lampooned almost everywhere, especially by Jimmy Kimmel telling parents to premasticate for their own children. I think he just likes torturing kids. So I decided to look at this objectively and see if there are advantages to pre-chew food for children. Premastication has been used to feed infants and wean them off breast milk in many cultures. A 2009 article from Gretel Pelto and colleagues, “Premastication: the second arm of infant and young child feeding for health and survival?”, attempted to determine the prevalence of premastication. The group mined Human Relations Area Files (HRAF) containing data on 370 different cultural groups around the world from the past 50 years. They found 119 files from different cultures that contained text about infant feeding or weaning, and 38 of those mentioned premastication. Of those 38 cultures, 31 practiced premastication solely to provide food to children (the others references spiritual or medicinal reasons). That means, from this sample, at least 1/4 of cultures from hunter-gatherers to agricultural societies have practiced premastication. To determine whether premastication may be under-reported in these ethnographic studies, they recruited Chinese students from the University of Beijing to interview their mothers or caregivers and ask about infant feeding practices. From 104 interviews, 63% of caregivers had practiced premastication. Based on these snapshots, the actual number of caregivers that use premastication to feed their children may be higher than reported. A 2008 FDA study in the U.S. found only 14% of mothers pre-chewed their infant’s food, with an inverse correlation to education. Premastication can vary greatly between regions and cultures within America, as 65% of African-American mothers and grandmothers from Omaha, Nebraska reported premastication practices. These numbers my be surprisingly high for those that have not been exposed to this behavior, but clearly show that premastication is used to feed children in many modern societies. The real controversy stems from whether this practice is actually beneficial to children. Breast milk should be supplemented with other foods for children around 6 months old to provide proper nutrition. Several studies have determined that production of salivary enzymes change with age, tooth eruption, and diet. There is an increase in amylase, or the enzyme that breaks down starches, as the child grows. By 3 months of age, children have 66% salivary amylase activity as adults. The importance of salivary amylase is somewhat controversial because the pancreas also secretes this enzyme into the small intestine during digestion. By 9 months of age, children have adult levels of pancreatic amylase production. In fact, many digestive enzymes that break down protein and fat are found past the mouth in the digestive tract. Unless there is a known problem with a child’s salivary enzymes, there are no data I could find to support the need for adult salivary enzymes in children’s mouths. In fact, as children are exposed to more foods, their bodies adapt to produce more enzymes on their own. On the other hand, there is actually a lot of overlap between antimicrobial factors (which help the immune system), hormones, and growth factors between breast milk and saliva. When a child is weaning off breast milk, premastication could provide some beneficial factors that the child is losing from reduced consumption of breast milk, but again, many of those factors children begin producing themselves. Some believe premastication is a way to bond with your child, although you don’t have to perform mouth-to-mouth to transfer pre-chewed food. A hug and a kiss might work to bond also. The biggest problem with premastication arises from the transfer of pathogens. This is especially problematic in less developed countries where more people unknowingly carry hepatitis, herpes, HIV, Epstein-Barr, and other viruses. Peridontic diseases can also be transmitted from the mother to the child. Even in developed countries where mothers know their viral status, premastication could transmit H. pylori, the bacteria that causes stomach ulcers. Although some argue that premastication is beneficial and has just fallen ‘out of vogue’ much like breastfeeding did 50 years ago, the major benefits of premastication remain unproven. There are no controlled trials on premastication because they would be unethical to perform. Premastication was probably necessary before the average person could easily make or buy their own baby food. The science behind premastication is just not there yet to promote the practice if other means to feed a child are available. However, I don’t think anyone should be condemned if they choose to premasticate. If a mother is free from transmissible diseases and feels like this might help a child wean off breast milk, then she could try it…but maybe don’t post a video of it on the internet. For everyone else, just put the meat in the blender. News broke yesterday about Sketchers settling charges against them from the Federal Trade Commission (FTC) for $40 million. The FTC claims the company “deceived consumers by making unfounded claims that Shape-ups would help people lose weight, and strengthen and tone their buttocks, legs and abdominal muscles”. Now, if you’ve ever seen Shape-ups shoes, you might think they would look good with a nice pair of slacks (I’m using slacks as an out-dated term from the 80’s). I personally would never buy shoes that look like that even if the company claimed it would tone 100 different muscles, and I wear athletic-looking shoes (I even have a different pair of Sketchers!) almost every day. I apologize to any of my friends or family who bought these shoes (Amy) but they just didn’t do it for me. Aesthetics aside, Sketchers made false claims about Shape-ups, Resistance Runner, Toners, and Tone-ups shoes. Just the names are enough to get a person excited (good marketing! ), but telling consumers they will perform miracles such as losing weight (without changing your lifestyle) and falsifying clinical study data is just stupid. Great marketing always puts a shine on products, but you still “can’t polish a turd”. (No matter what the Mythbusters say). There will never be a miracle pill (or shoe) that will make you lose weight, get in shape, and tone your muscles without any effort from you. The human body is an amazing organism and if you treat yours right, it will reward you. There are so many complicated systems at work inside your body that scientists working on a ‘miracle weight loss pill’ are discovering that there may not be such a thing. I think the best story about finding an ‘obesity cure’ begins back in the 1950’s. A company that breeds new animal strains for scientific research, Jackson Laboratories, discovered a strain of mice that was constantly feeding, lethargic, and obese. These mice could not get enough food and would eat until they couldn’t move. (The blob on the right is one of those mice). Leibel, RL (2008) International Journal of Obesity, 32:S98–S108. When molecular biology and DNA genotyping finally caught up in the mid-1990’s, Dr. Jeffrey Friedman, Dr. Rudy Leibel, and their colleagues discovered that this mouse strain, named ob/ob (due to its obesity) had a mutation in a hormone called leptin. 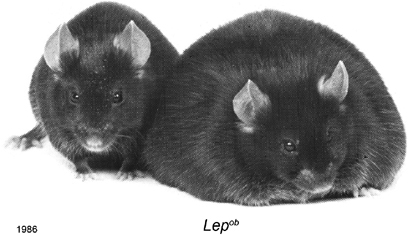 They gave these obese mice leptin, and amazingly they stopped constantly eating and lost weight. The miracle drug was found! Even the name leptin was derived from the Greek word leptós, or thin. Clinical leptin trials began…and ended…because people were not losing weight. The problem was, most obese people are not obese because they have low levels of leptin. Turns out, this hormone is made by your fat cells, or adipocytes. The adipocytes secrete leptin into the blood stream, where it travels to your brain, finds the leptin receptors, and basically says, “hey, you, stop eating.” So what do obese people have? Lots and lots of leptin circulating in their blood from all of their adipocytes secreting the hormone. Many obese people have leptin resistance, which means their brain cannot use the leptin signals they are receiving to tell you to stop eating. So giving these people more leptin makes no difference. This research did help some people who have similar mutations to the ob/ob mice or those that actually have a deficiency in leptin production. However, for the majority of obese people, it could not help them. The human body is great at adapting to its environment and working to survive. If you help it along a little, you might be surprised at what it can do. Don’t look for a magic pill or a magic shoe. They just don’t exist. So instead of buying these shoes and waiting for your calves to be toned while walking a block to your car, put on real sneakers and walk a little faster and a little farther, and then you may see some results.